2018.06.01. Biospire starts to support Myoridge for their international business development. 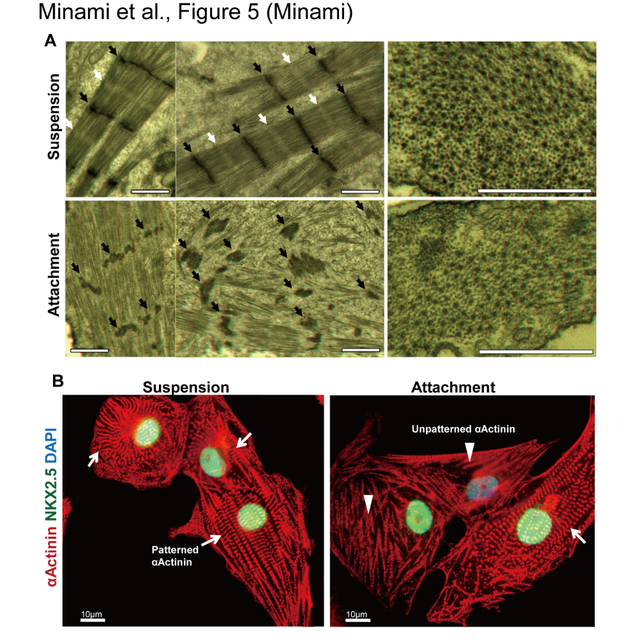 CarmyA are produced in 3D and chemically-defined culturing conditions, which induces further maturation as cardiac cells with having better sarcomere structures showing more patterned Z-bands compared with conventional 2D culturing methods. Fig.1. Electron microscopy images of typical CarmyA (above) and Immunofluorescent staining images of CarmyA (bottom-left) and conventional 2D cultured iPS-derived cardiomyocytes (bottom-right). Fig.2. 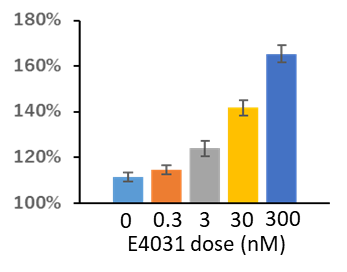 Percentage of patterned cells for CarmyA and 2D cultured cardiomyocytes. 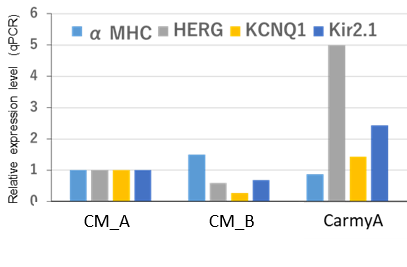 CarmyA expresses higher voltage-dependent K+ channel genes (HERG, KCNQ1, Kir1.2) than other commercially available iPS-derived cardiomyocytes. CarmyA also shows matured electrophysiological properties. Fig.3. Relative comparison of gene expression levels for key cardiac markers. CarmyA shows good arrhythmia responses (long QT, EAD and bradycardia) with introducing Terfenadine and Verapamil. Fig.4. Ca2+ imaging of CarmyA before and after exposure to Terfenadine and Verapamil. CarmyA shows clear intracellular Ca2+ wave prolongation (long QT) and EAD (Early After Depolarization) with dosing E4031, a typical HERG channel blocker. Fig.5. Ca2+ fluorescence and motion result before and after CarmyA was exposed to E4031. Fig.6. Dose response data when CarmyA was exposed to E4031. CarmyA shows more typical cardiotonic responses (compared with conventional iPS-derived cardiomyocytes) with showing tachycardia with being exposed to Isoproterenol – a typical cardiotonic drug. CarmyA also shows clearer Ca2+ wave prolongation with being exposed to Terfenadine – a typical long QT compounds. Fig.7. Ca2+ imaging of CarmyA and conventional iPS-derived cardiomyocytes being exposed to Isoproterenol and Terfenadine. CarmyA shows stronger mitochondrial activities compared with conventional iPS-derived cardiomyocytes. Fig.8. 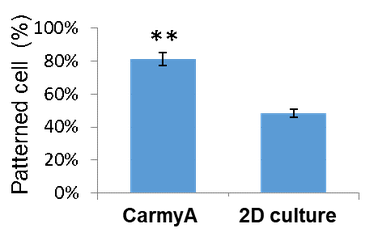 Oxygen consumption rate (OCR) of CarmyA and conventional iPS-derived cardiomyocytes. Myoridge co-developed our original software being able to visualize both fluorescence and motion peaks. This software also provides good Ca2+ visualization in multi-well plates, therefore suitable good for high throughput analysis. Fig.9. Outlook of fluorescence (left) and motion (right) analysis screen using the developed software. Fig.10. Ca2+ visualization using 96 well plate. 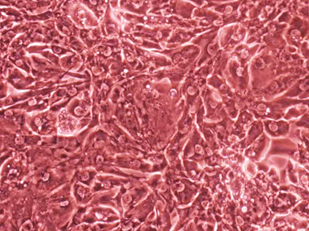 Myoridge established its own quality control systems with guaranteeing the cell numbers and key functions as cardiomyocytes. Customers are able to access our quality data sheet (certificates of analysis) upon request before placing orders. CarmyA are cryopreserved and delivered to world-wide using special cryogenic delivery services. Specification of typical CarmyA cryopreserved cells. “We are flexible to produce bespoke cell products and services for our clients”. Myoridge is able to produce iPS-derived cardiomyocytes with flexible formatting such as spheroids, sheet and even fiber. 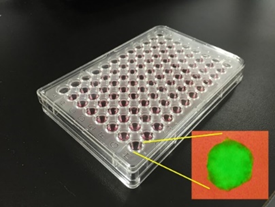 Spheroids: Typically 100 to 1000 um diameter with using 3D platform and provided in 96 well plates. Sheet: Suitable to observe pulsation. Flexible sheet sizes on demand. Fiber: Suitable to observe pulsation and long-term culturing. Flexible fiber length on demand. 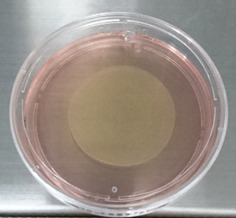 Myoridge is capable to produce disease modelled cardiomyocytes using integrated iPS-formatting, gene-editing and differentiation techniques. Please enquire for further details. Cryopreserved cell vials are shipped using special dry-shipper with guaranteeing cryogenic temperature. Thawing and plating media are separately shipped with dry-ice. Customers are responsible for local duty and taxes. Standard terms and conditions are available upon request.